Item shown above : Cherry FINISH, Solid wood with a glossy protective coat (Flag NOT included). Triangle Flag Display Case. 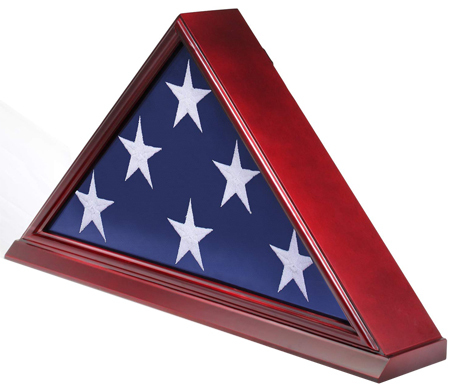 Preserve and display a cherished flag in this handsome polished wood and glass Triangle Flag Display Case. The fine quality flag case would be an honor to display any flag. This Flag Case is fine in every detail. Please view all angles by click the small picture. This item is crafted only by our senior craftsmen with hand selected fine quality hardwood. Matted interior makes it very flag material friendly. Wall brackets to hang. Glass cover to protect from dust and damage. No assembly required. Holds 5'x 8' or 5' X 9.5' Nylon or Cotton flag. Interior: 23"W on Base, 11.5"H, Two Sides: 16", 2.5"D Attn: for large flag size up to 6 feet X 9.5 feet. The area on the base where you can put engraved Plaque (NOT INCLUDED) is 0.75" Height.